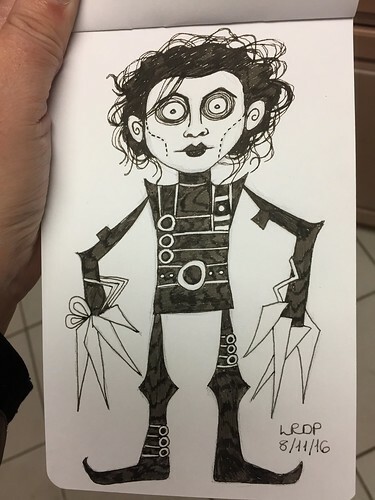 Next up in my drive to complete my Inktober sketchbook is this little illustration of Edward Scissorhands. I recently rewatched the movie having not seen it for many moons. I was pleasantly surprised with how well it holds up and I still think it is Danny Elfman’s best score. Despite seeing the character on screen only a short while ago, I am pretty sure I have those critical scissorhands completely and utterly wrong. 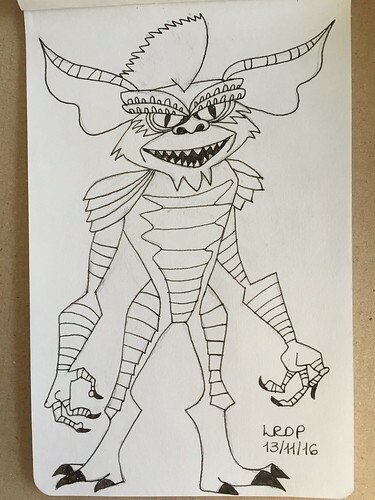 It’s funny that the most iconic thing about the character design is the thing I could not conjure up in my mind’s eye as I drew him. Despite the hands – which are probably more garden shears than scissor blades – I do think Edward is instantly recognisable from my illustration. 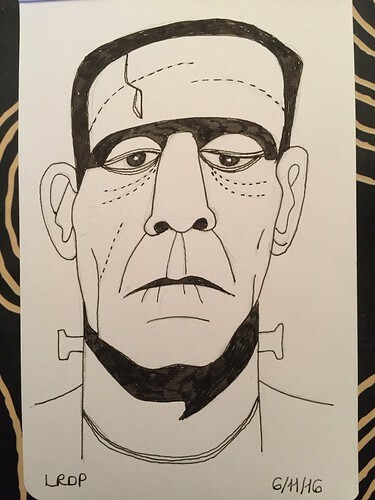 Continuing to fill up my Inktober sketchbook, I decided that the next creature that had to feature was Frankenstein’s Monster. In addition to Mary Shelley’s ‘Frankenstein’ being one of my favourite novels – and one I taught several times – James Whale’s ‘Frankenstein’ is my favourite of the Universal monster movies. I am, therefore, somewhat surprised at myself that the poor old Monster did not appear earlier in my series of Inktober drawings, especially since I did draw his Bride. My illustration is definitely influenced by Boris Karloff’s incarnation of the Monster. I am pretty pleased with how this turned out. Continuing with my extension of Inktober, I turned from the Munster family to the Addams family. As a child, I much preferred ‘The Munsters’ but I got more into ‘The Addams Family’ as I got older. I always loved Morticia. 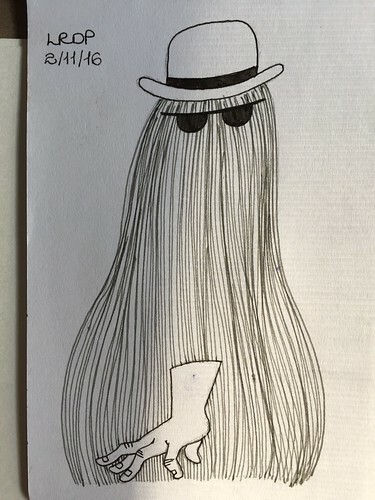 For my illustration, however, I decided to draw two of the regular but subsidiary characters: Cousin Itt and Thing. My mother used to refer to me as “Cousin Itt” pretty frequently. She would send me out of the door each morning with my hair neatly braided and with ribbon bows and I would return with my hair in a scruffy mess, hence the comparison to Cousin Itt. I remain much more of an Itt than a Morticia. The simplicity of both characters’ designs was a gift for speedy drawing. You have not entered a time warp. It is indeed November which means that it is no longer October or Inktober. Regardless, I am extending Inktober by a few days. I had a conflict between two different aspects of my control freakery – on the one hand, Inktober should only last the 31 days of the month and then be done, dusted, completed; but, on the other hand, I had a partially complete sketchbook that I did not want to leave blank or repurpose for some other drawings because that would be too mentally messy for me. 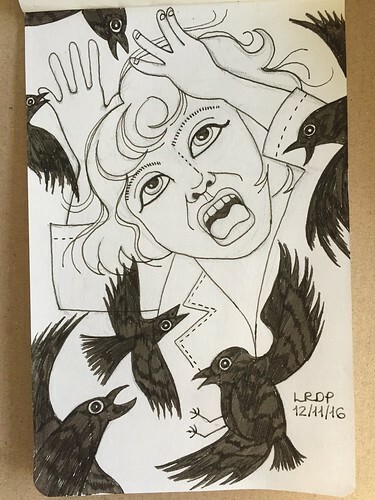 The solution, therefore, was to extend the regular ink drawing practice of Inktober into November just long enough to fill the sketchbook with illustrations on the same theme – things spooky, horrible, monstrous, or gothic. I may not draw daily since there is nothing compelling me to do so but if I get the chance to draw when supping my morning cuppa then that is what I shall do. 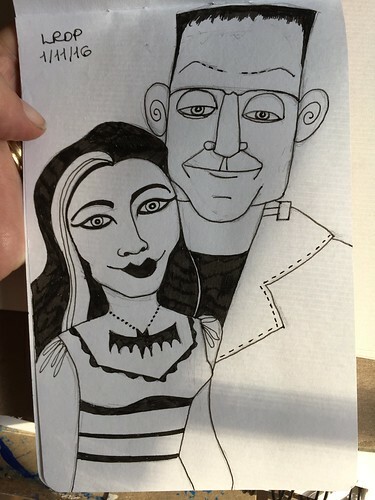 First up in this Inktober extension was a portrait of the Munster parents, Lily and Herman. I loved ‘The Munsters’ when I was a kid. Because I loved the classic Universal monster movies, I loved watching a show that depicted these classic monsters all living together as a family, along with freakishly normal sister Marilyn. I have tried to convince my kids to watch episodes from the show but so far they are not biting. I think my Herman could stand to look more goofy because he looks a bit sneering instead of lovably dorky. For a ten minute drawing, however, it will do the trick. I did it! I completed the Inktober challenge! Woohoo! I actually feel accomplished. I managed to produce a daily drawing despite being completely and utterly overscheduled. And I loved it! Ten to fifteen minutes of drawing every day with my morning mug of tea was actually very therapeutic, my little oasis of creative calm before facing the day. 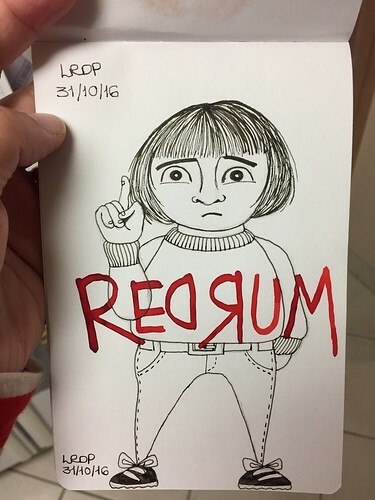 For my final Inktober drawing, I turned to another movie for inspiration. ‘The Shining’ is one of my favourite horror movies because it resists having its meaning pinned down and is unsettling precisely because not everything is explained and the denouement does not end with a neat little bow. If you are a fan of the movie and have not checked out the documentary ‘Room 237’ then I highly recommend it. Very nerdy but learned. Anyway, I decided to draw Danny in the Redrum scene. Purists will note that Danny actually has a motif on his shirt in this scene but I could not be bothered pulling up a photo reference or building in that level of detail. I still think it is clear enough what character and scene I drew. Followers of my blog might recall that this summer my kids and I reenacted some scenes from ‘The Shining’ when we spent the night in a hotel in Toledo that reminded me of the movie. I managed to sign this final Inktober drawing twice. Doh! I signed and dated it once when I finished the black ink work and then once I had added the red text. Things that happen when you rush!